White linen straight shirt with gussets (cămașă cu barburi) decorated with white embroidery on hem. A narrow row of white crochet lace is attached to the hem and sleeve ends. Summer trousers (izmene) made of cotton or linen fabric. Waistcoat (laibăr) made of black felted woollen fabric (postav). Sheepskin or fur hat (căciuli). 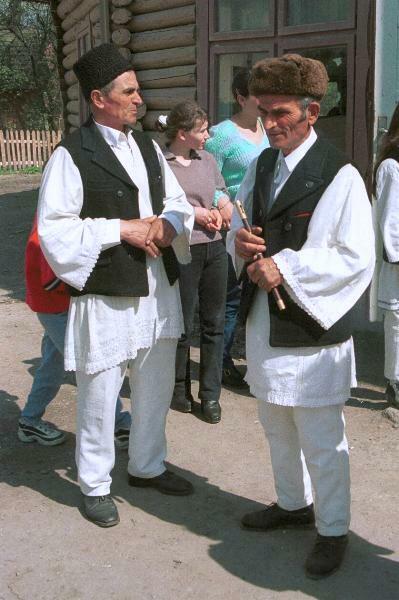 Photo taken in Arefu, Argeș in April 1999.